Just an old demo, but kind of nice. Essentially, it started with a challenge of giving me strange technical terms that I would have to incorporate into a song. The words that immediately came back included Epiglottis, Flagella, Dictyostelium, Homo erectus, and Phthalates. And so, I went ahead and wrote something pretty quick about how sometimes it’s kind of wonderful to revel in jargon, especially when you’re nattering on with your scientific peers. In some ways, I kind of feel like it’s my own unofficial theme song to the ScienceOnline2013 conference coming up in January. 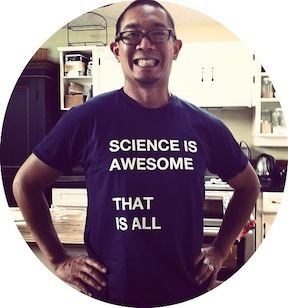 This is my tribe – we talk science, and we love it. Play above or here is the mp3 to check out, and lyrics reprinted below. One of these days, I’ll have to re-record a second take (sound levels are very low), and maybe with a capo on the second fret to move it up vocally a bit. Also, you may notice that the word Phthalate didn’t make the song – that was more because I didn’t know how to pronounce it! If you let me know how to say it properly, maybe I’ll write a song just about that. And let’s just say it’s o.k. That I kind of love your jargon fueled ways.